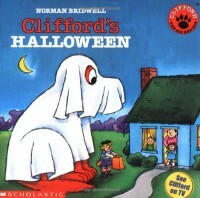 Emily Elizabeth and Clifford love Halloween, but they can't decide what Clifford's costume should be this year. Last year, he dressed up as a ghost and she was a pirate. They went to a party and played many games before going out trick-or-treating. This year, Emily Elizabeth is going to be a fairy princess, but Clifford still hasn't decided. The book ends by asking what the reader thinks Clifford should be. This book would be fun for a Halloween writing activity in first or second grade. Students could brainstorm ideas, draw a costume on Clifford, and write a sentence about it: "For Halloween, I think Clifford should be a..."